The Terratrio 2P is a new tent from Vaude designed specifically for the UK market, using the same AL 7001 T6 alloy pole system as the more established Taurus. 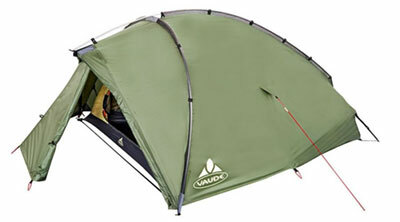 It's a geodesic design, available in just one colour - green - and supplied with inner and flysheet attached. Pitching is pretty straight-forward - although the instructions at first sight are a little ambiguous. Nonetheless - even first time, I pitched it in about 5 minutes. The (two) poles are actually on the outside - which is a bonus if it's raining. Minor niggles are that the tent pegs are a little hard to get into the ground (and even harder to extract). Also it took a little while to adjust the guy ropes to get good separation between the fly-sheet and the inner all round. Some parts of the pole system are fixed into the outer which makes packing it a bit difficult. Once up, the Terratrio is very stable. The yellow interior (plus grey floor) make for a very pleasant feel inside. There is certainly room for two people whose gear can be stored in the excellent porch area and also inside at the lower end of the tent and in the 2 pockets. No doubt in order to save weight, the tent is higher at one end - where two people (5'10-ish) can sit-up quite comfortably. Condensation was not a problem with one person sleeping in it during a relatively mild UK Spring night. There's one door but that has a dual opening so one side can be left closed if conditions demand it. I've not been using it long enough to comment on its durability - however I always try to use a protector for groundsheets and would do so in this case as well. The Terratrio from Vaude is an understated, efficient tent - great value and a fine option for backpacking and/or mountain trips.